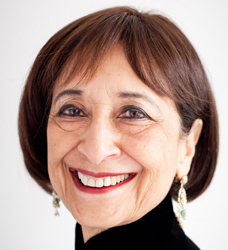 Madhur Jaffrey a multifaceted personality born in Delhi, is an actress, TV presenter, movie script and cook book writer but it is for her cookery that she is best known. She went to England on a scholarship to learn acting and after graduation married Jaffrey. She settled down in New York and gave birth to three daughters, Meera, Zia and Sakina. She began her career in films with the Ivory-Merchant production, 'Shakespeare Wallah' winning her the best actress award at the Berlin Film Festival in 1965. Some of her other films are 'Heat & Dust', 'Autobiography of a Princess', 'The Assam Garden', 'The Perfect Murder', 'Six Degrees of Separation' and 'Wolf'. She turned to cooking as a new career after she divorced her husband, actor Saeed Jaffrey, to make both ends meet. It was an eye opener into a range of Indian dishes. She wrote cookery books like 'Madhur Jaffrey's Indian Cooking', 'A Taste of India 'and more recently 'World vegetarian'. Later she appeared on T.V.shows but acting always remain as her first love. After divorced from Saeed Jaffrey she is remarried and now lives in New York City. She has three children -- Zia, Meera, and Sakina Jaffrey. She has hosted a cooking series on BBC television, having appeared both in film and on stage.